policies requiring regional approval are underlined in green. Until all the original appeals are resolved, both Mississauga Plan (2003) and Mississauga Official Plan will need to be referred to since they are both partially in effect. Once all matters have been decided, Mississauga Plan (2003) will no longer apply. The office consolidation is prepared for the purpose of convenience only. For accurate reference, the original Plan as approved by the Region, Ontario Municipal Board decisions and amendments to the Plan should be consulted. The following list is a tracking sheet of all Mississauga Official Plan Amendments (MOPAs) and Local Planning Appeal Tribunal (LPAT) decisions that have occurred since the Mississauga Official Plan consolidation of March 13, 2019 (as posted Online). This list contains details of all the amendments that have been approved by Council since March 13, 2019 as well as appeal activity since this time period. Post office consolidation activity is summarized in the Mississauga Official Plan Post Consolidation Activity Sheet. All amendment documents and corresponding appeal material are posted on the Mississauga Official Plan Amendment Site. 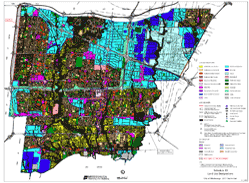 To understand the planning rationale and policy objectives of Mississauga Official Plan, it should be read in its entirety and all relevant text, tables and schedules are to be applied to each situation. The Office Consolidation & Information section is for convenience only and is not considered part of Mississauga Official Plan. This section tracks Mississauga Official Plan approvals, amendments and appeals, and lists policies currently under appeal and in effect policies. It also tracks the status of the original 19 appeals to the October 5, 2011 Region approved Mississauga Official Plan. Note: Some of these PDF files are quite large and may take some time to download. For best quality, please print in colour. (Schedule 10) and click to enlarge the area. For specific property and zoning information, contact: 3-1-1 or, 905-615-4311 if outside city limits / email us.